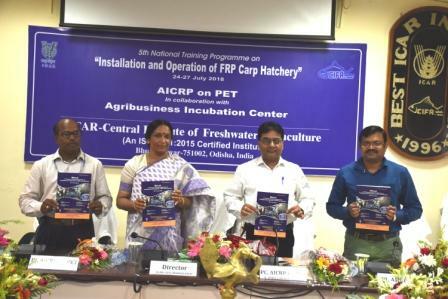 Bhubaneswar: 5th National Training Programme on “Installation and Operation of FRP Carp Hatchery” was inaugurated on 24 July, 2018 at ICAR-Central Institute of Freshwater Aquaculture, Bhubaneswar, Odisha by Dr R.K. Singh, Project Coordinator, ICAR-All India Coordinated Research Project on Plasticulture Engineering and Technology and Director, ICAR-Central Institute of Post Harvest Engineering and Technology, Ludhiana, Punjab. He told that the AICRP on PET centre at ICAR-CIFA has contributed immensely to the farming community of India and developed several farmer friendly technologies and gadgets for use by them. The notable one is FRP carp hatchery. He applauded the achievements and role of ICAR-CIFA PET centre and wishes all success to the programme and to the participants. Dr. Bindu R. Pillai, Director, ICAR-CIFA as president of the function said that the AICRP PET centre is operating at ICAR-CIFA, Bhubaneswar since 1988 and developed several gadgets for aqua-farmers of the country. FRP carp hatchery which was released to the nation in 2006 has gone to 26 states of the country. For quality fish seed production the FRP carp hatchery is in high demand. Dr B.C. Mohapatra, Principal Scientist & Project Leader, AICRP on PET, ICAR-CIFA; and Course-Director of the programme highlighted the importance of the training programme for benefit of the hatchery users. Since 2011 the institute is conducting regular training programmes on installation and operation of FRP carp hatchery to the users of the country. Dr N.K. Barik, Scientist, ICAR-CIFA and Coordinator of the programme proposed vote of thanks. This training programme will continue till 27 July, 2018 and will cover A-Z of the portable FRP carp hatchery technology. More than 40 participants from different states of the country (Maharashtra, Chhattisgarh, Jharkhand, Telengana and Odisha) are participating in the programme. This is the fifth such training programme, where advanced farmers, trainers, state officials and subject matter Specialists of KVKs are participating. The programme has the primary objective of providing advanced knowledge, skill and technique of fish seed production using portable FRP hatchery technology to its users. The trainees will use the knowledge to further train and develop fish seed production capacity in their locality, thereby contributing the seed production of the country. 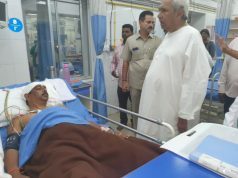 By now more than 400 units of the hatchery have gone to 26 states of the country. The performance of this technology across these diverse settings is quite remarkable. Geographically, every region of the country has been touched upon. In a single operation it produces 1.0 – 1.2 million fish seed. It is mobile in nature, easy to installed, operation and repair. Longevity of this hatchery is 15 year or more. It is estimated that one small farmer can earn a profit of 1.5 lakhs rupees approximately in a span of three months through proper use of the gadget.